"If it goes ahead with another test in this area, it could risk radioactive pollution"
The area around North Korea's nuclear test base may be destabilized after recent tremors and landslides, Reuters reported, and experts say it may not be used for tests much longer. A small, magnitude 2.7 tremor took place near the Punggye-ri nuclear site, according to South Korea's weather agency, and it did not appear to be man-made, like two others since Pyongyang's powerful Sept. 3 nuclear test. That test was measured with a magnitude of 6.3. "The explosion from the Sept. 3 test had such power that the existing tunnels within the underground testing site might have caved in," said Kim So-gu, head researcher at the Korea Seismological Institute. "I think the Punggye-ri region is now pretty saturated. If it goes ahead with another test in this area, it could risk radioactive pollution." A Washington-based monitor of North Korea has also detected numerous landslides throughout the site, more than after any previous test. 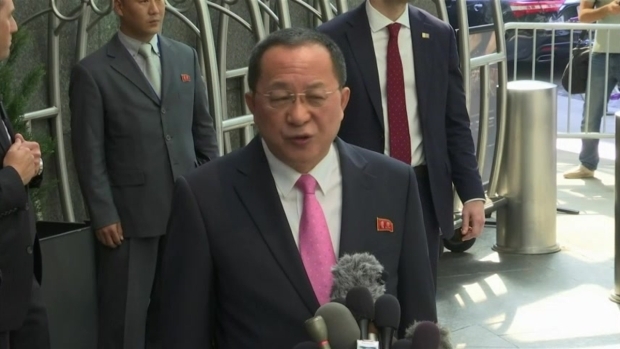 North Korea's top diplomat says President Donald Trump's tweet that leader Kim Jong Un "won't be around much longer" amounted to a declaration of war against his country. Foreign Minister Ri Yong Ho told reporters Monday that what he called Trump's "declaration of war" gives North Korea "every right" under the U.N. Charter to take countermeasures, "including the right to shoot down the United States strategic bombers even they're not yet inside the airspace border of our country." Ri Yong also said that "all options will be on the operations table" for the government of the Democratic People's Republic of Korea. Ri referred to Trump's tweet Saturday that said: "Just heard Foreign Minister of North Korea speak at U.N. If he echoes thoughts of Little Rocket Man, they won't be around much longer!"